Excellent though the performance of both the Mk.5 and STB2 were with their Papst motors and Bogen heads, Brenells were not rated sufficiently high enough by recording studios. 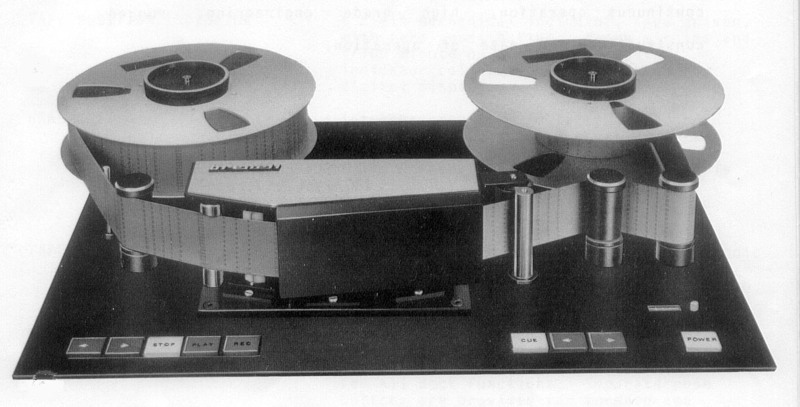 It very much appears the reason for their rejection was down to a somewhat 'flimsy' deck construction compared to Ferrographs; indeed it is often held that while Ferrograph had the edge on robust engineering, Brenell had the more important edge on sound quality. However, with its steel cradle, the STB1/2 went some way towards overcoming that particular problem but the inability to be operated remotely was a major handicap. 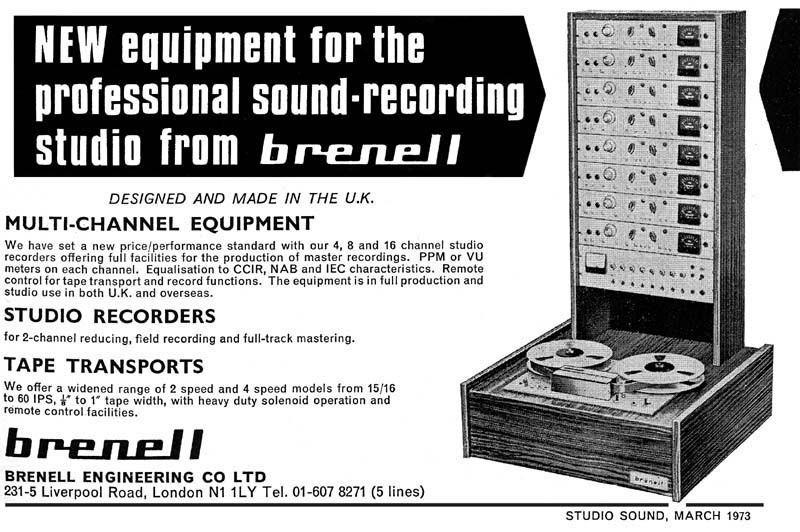 As Brenell were keen to enter the professional and studio markets, an entirely new solenoid operated prototype, with optional remote control and transistorised pre-amp appeared in 1968 which evolved into the direct drive 10-1/2" transport deck specially designed to fit into a standard 19" studio frame - hence the eponymous Type 19, launched in 1969. Note that the example shown (right) has a well worn deck plate and non--original illuminated push button controls; the original machine had plain round coloured buttons. Frank Underhill was almost certainly responsible for its development as he had already carried out free-lance design work for Brenell and other manufacturers; he had earlier designed the advanced Planet and TRD (Tape Recorder Developments) decks before joining Brenell on a permanent basis in 1971. Remarkably little however is known of Frank. Prima facie, the Type 19 met all the studio requirements. The massive 2-speed direct drive Papst motor offered pairs of speeds from the 15/16ips to 60ips range, with excellent wow and flutter. Heads were specified by the customer, or retro-fitted by them - there was space for four heads on the pressure pad fee parabolic path. 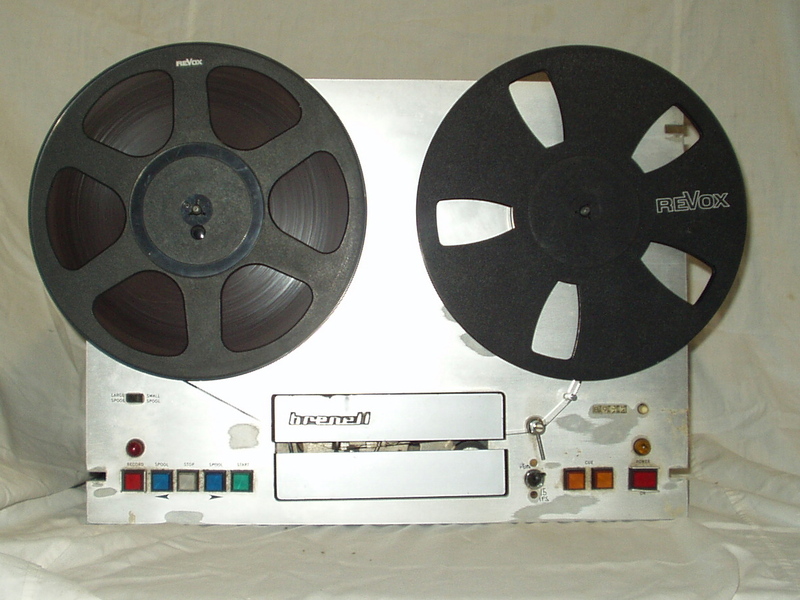 Indeed Brenell offered a choice of professional Bogen or Branch & Appleby heads from full track to 1/4 track mono and stereo, initially only in 1/4" format, but eventually up to 1" 8-track although it was soon discovered that the 1/8" thick alloy deck-plate flexed too much for 1" operations and required substantial bracing. There was even an experimental 2" Type 19 (which would later lead Brenell to develop the Type 600) and a standard 4-speed version using a much modified Mk.6 idler drive and motor. As can be seen, the Type 19 was an incredibly versatile, if flawed, platform but never-the-less found a ready market in studio, specialist military and industrial applications including ultra-slow speed seismographic data recording and high speed cassette tape duplicating machines using pancakes of 1/8" cassette tape. By the early 1970s, Robert Hahn was looking to retire and discreetly sought new blood to continue Brenell's unrivalled success. But it was also for Brenell a dangerous time, for the domestic market was in serious decline and unable to provide the cash-flow to support further research and development. Fortuitously, in 1974 Alex Nicholas, a talented, visionary, young businessman and audio engineer, came to its rescue and bought into the company. He had visions of developing the fledgling multi-track musician's home-studio market: Brenell's expertise, highly skilled staff and excellent engineering facilities proved ideal. The Type 19 was an ideal platform on which to develop a 1" 8-track deck complete with a stack of eight modified Brenell mono pre-amplifiers: it stood over 40" high! Thus was born one of the first British made 8-tracks. It caught the eye of a young, enterprising British mixer company, Allen & Heath, who were aiming to expand their product range with an inexpensive, 'Turnkey' studio console complete with multi-track tape-deck. Although the new 1" 8-track Type 19 suffered many development problems (it required substantial bracing and more powerful motors) it did lead to an entirely new, purpose made, 1" 8-track with miniaturised plug-in pre-amplifier modules. To Allen & Heath, this new Brenell model showed great potential, especially with its respected pedigree, and undercutting Japanese and American competitors, but above all it was British - at a time when 'Made in Britain' still held considerable appeal. Thus begun a healthy working relationship between Brenell and Allen & Heath but by 1975, Brenell were in a serious cash flow crisis through a terminal decline in domestic sales. Allen & Heath were keen to ensure development and continuity of supply of this 8-track and stepped it, buying the Brenell company. They then concentrated on developing the promising new 'Mini-8', evolved from a new Mk.7 prototype, and duly abandoned production of Brenell's existing 1/4" models - the Type 19 however survived as an industrial, multi-purpose deck until 1983. Of greatest value to Allen & Heath, though, was Brenell's manufacturing facilities and engineering expertise and by 1977, they had moved production of A&H mixers into Brenell's Liverpool Road works with many of Brenell's elderly production machines replaced by new CNC automated machinery but many of the engineers, who had been there for most their working lives, took early retirement taking with them a wealth of knowledge and skills for there was no longer a place for 'old fashioned' manufacturing techniques. Consequently, many former in--house operations were now sub-contracted. Concurrent with development of the new miniaturised 8-track Type 19 was a new professional deck, the Mk.7. The prototype was developed for both 1/4" and 1" formats (from which the 'Mini-8' evolved). This hybrid owed much to the Type 19 but although only a parabolic path 3-head, 2-speed (7-1/2 + 15ips) design with advanced electronics, and was aimed squarely at the professional user or as a 2-track mastering deck/studio monitor, as well to military and BBC specifications. Customers could specify full, 1/2 or 1/4 track, mono or stereo heads and low speeds... in theory... for while it was launched ahead of the Mini-8 in 1976, by virtue of production delays with the Mini-8's pre-amplifier modules, the Mk.7S stereo never did reach full production status as Allen & Heath were now interested only in the lucrative multi-track market. Indeed hundreds of brochures has been printed but as only a handful of Mk.7S tape recorders had been built, the majority were given away to selected clients as an incentive to buy the A&H mixer + Mini-8 console package. Despite this, development work on the Mk.7 continued in the background with a new full logic control, adapted from the Mini-8, and a 4-channel model, but a policy decision taken by A&H led to abandoning all 1/4" models, ending further work on this very promising and truly delightful Mk.7S. 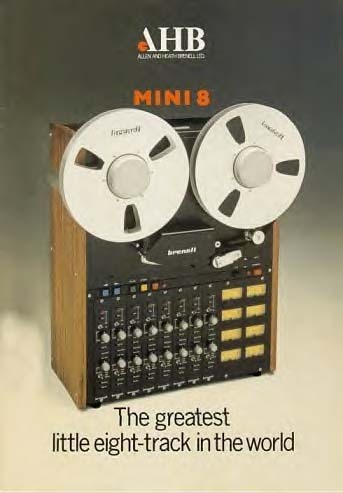 Unfortunately for Brenell, the original Type 19 based 1" 8-track was also underdeveloped when it was launched, losing orders to the Japanese, especially Otari and TASCAM, while Brenell worked hard towards the new purpose built miniaturised, portable, 'Mini-8' with its new, more rigid, cast alloy deck plate and indirect motor drive to improve wow and flutter performance due to the greater drag of a 1" tape. Delays in producing the new miniaturised pre-amplifier modules didn't help either, but when the Mini-8 was eventually launched, it received critical acclaim: it was a revolutionary, compact design with a performance and potential of a professional studio deck, but at a considerable saving over its competitors. It soon found many friends among musicians, composers and aspiring pop groups, such as Phil Collins for example. But it was not without fault, and a much improved Mk.II soon followed fitted with Brenells newly designed self centering NAB hubs, logic control and Vari-speed facility. Under Allen & Heath, it was now marketed as an "Allen-Heath+Brenell" product, heralded as "The greatest little eight-track in the world" - which indeed it was - but sadly it failed to penetrate the staunchly patriotic American market in which Alien & Heath's mixers had gained a significant market share. An important caveat about the Mini-8 is its 'portability'; the 'portable' deck and pre-amp is heavy enough as it is, but the power supply unit is quite separate... and weighs almost as much! Encouraged by the Mini-8's success, the Brenell engineers sought to enter the professional 2", 24--track studio market as the only British manufacturer of multi-track decks. They had earlier dabbled with the problematical 2" Type 19, but with much experience from the Mk.7S/Mini--8, they developed in 1974 a new 2" model using a 1/2" thick cast-alloy deck - the Type 600, so called as it was 603mm wide. A hastily built demonstration model with Brenell's prototype pre-amps was built for the APRS, but it proved a troublesome machine in regards to motors, tape drag and electronics. Only around 5 or 6 pre-production models were built before they abandoned the project for a new, technically advanced, state of the art, micro-processor controlled capstan-less drive, 2", 24-track studio mastering deck in which the spool motors did all the work. Brenell's project engineer was now entering a new world of leading edge technology. 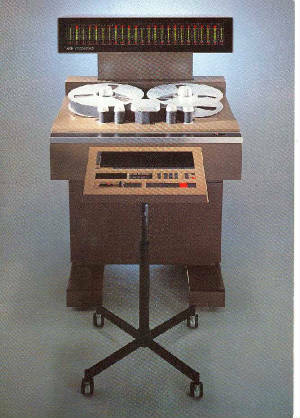 His "Syncon M24" of 1978 was an undoubted technical success and received great praise in a trade magazine preview, along with the accolade of the most beautiful tape-recorder ever made. Brochures were produced and a trade show stand booked, but quite unexpectedly, Allen & Heath abandoned the project a matter of days before the show, and began winding down production of the Mini-8 before withdrawing from tape deck manufacture to concentrate on their mixers at a new factory in Cornwall. Consequently, Brenell Engineering Ltd was formerly dissolved in January 1984. But that was not the end of either Brenell's or British studio tape deck technology and manufacture, for shortly before work had begun on the Syncon M24, senior Brenell directors and engineers had already left Allen -Heath+Brenell to establish a new business designing and manufacturing truly advanced multi-track studio mastering decks, freed from the constraints imposed on them by their Allen & Heath masters. Following the Syncon debacle, the project engineer left to join his former colleagues at Soundcraft Magnetics. 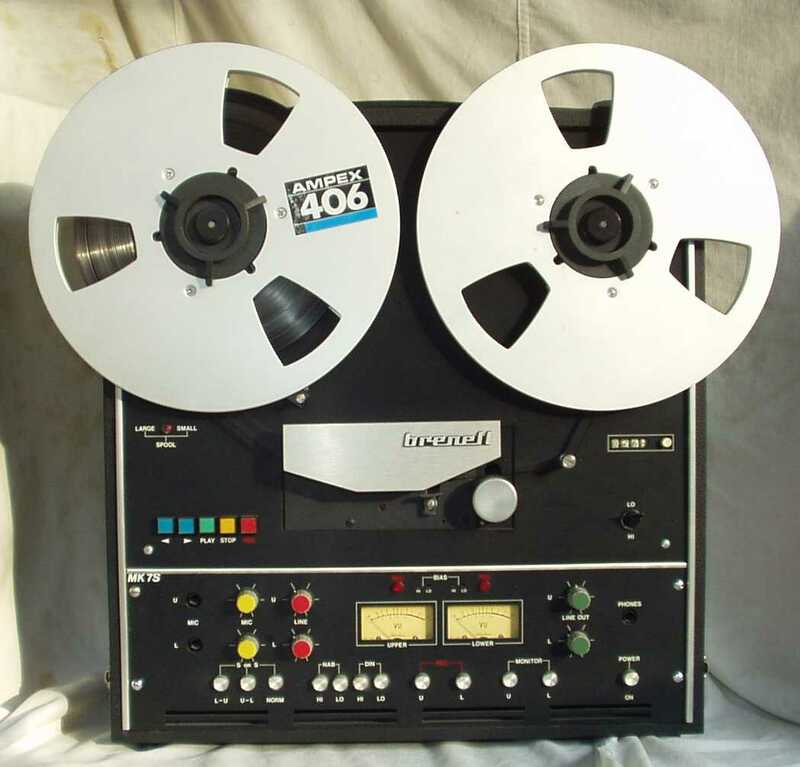 Unlike Truvox, Wright & Weaire, BSR and Collaro, Brenell's decks were seldom adopted by domestic tape-recorder companies, but one interesting example was designed and built around 1971/72 by Steve Wadey, of "Black is Black" pop-song fame. His 1" 8--track used a modified, solenoid operated Brenell Mk.510 deck (I believe later models used a modified Mk.610 deck); it also used Branch & Appleby heads, as fitted to the Type 19 and was operated remotely. 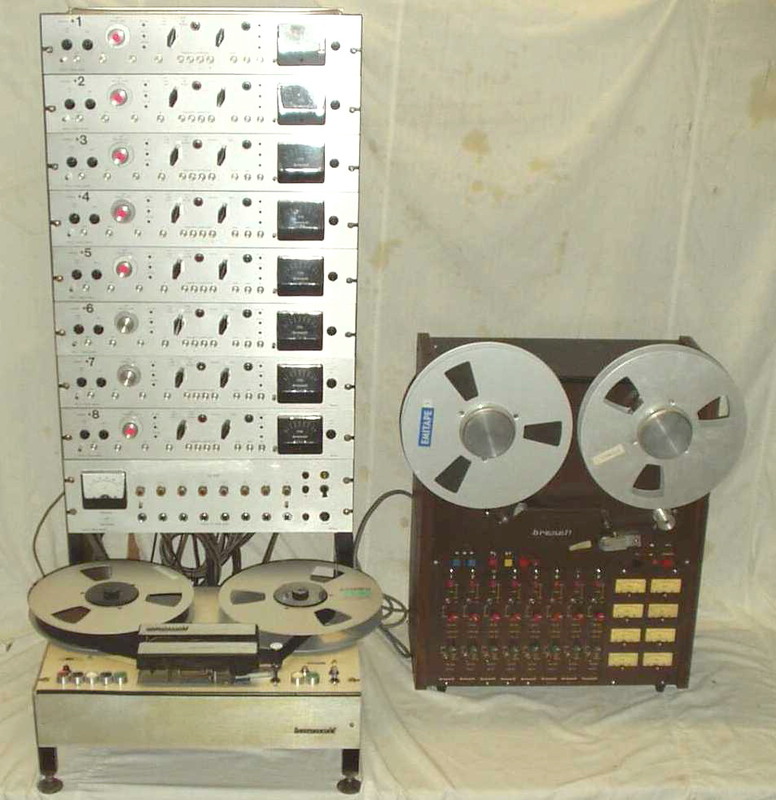 Although Brenell chose not to get involved, officially, Frank Underhill did work with Steve on its development but it was, to put it diplomatically, a remarkably crudely built machine with a bird's nest of wires and electronics: it was even offered in kit form for home assembly yet, by all accounts, as an introduction to 1" 8-track recording for budding musicians it gave a very good account of itself. 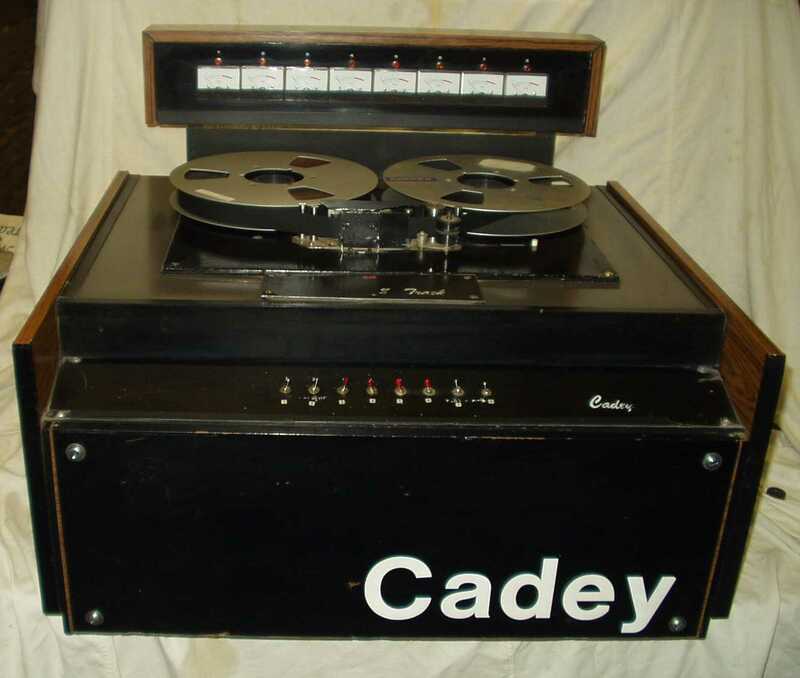 The much improved Cadey 2" model had better success. Few survive.